Costs are down slightly this year, but prom season is still a lucrative time of year for many merchants. Dancing the night away at the prom will be less expensive this year than last year, but it will still cost the average U.S. family close to $1,000 per teenager. While the price might be falling in much of the country, high school prom season is still a boon for businesses ranging from florists to dressmakers to limousine companies, which rely on spring proms to give them a jump-start for the summer wedding season. Holling estimated that prom season generates one-tenth of the company’s revenue for the year, but he would not give a specific amount. Portland Limousine rents four vehicles, ranging from a Lincoln Town Car sedan to a 14-passenger stretch SUV. Prom packages cost $600 to $900 for six-hour rentals. 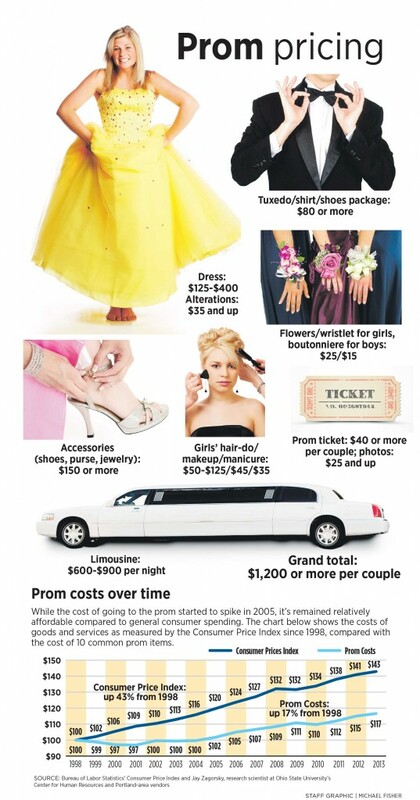 A national survey by Visa showed that prom spending will drop 14 percent this year, after three years of increases, but the average family still will spend $978 on clothes, limousine rental, a ticket and dinner. That’s a 21 percent jump from 2011, when the average cost was $807. To save money but still get a chance to look like a celebrity, some teenagers are turning to websites such as RentTheRunway.com, said local retailers. For example, a Nicole Miller strapless gown that sells for $995 in stores can be rented for $80. Such competition from Internet rentals and sales, and the endless choices available online, have prompted some retailers to scale back their prom business. Spoil Me now sells a limited line of prom dresses, concentrating mostly on bridal gowns. Maria Antonieta, who owns Maria Antonieta Couture in Portland, said many teenage girls are looking for sensual, shiny dresses that cost less than $150. Antonieta said she does a lot of alterations during prom season. Her handmade dresses, which can cost about $250 or more, appeal to students who want to splurge on something special or see them as something they will wear again. Most girls, however, don’t care about wearing a prom dress more than once, she said. “They want to feel like a star. They’re so excited. But it’s a result of the economic moment – we do have people who will come in with an idea but have a budget that’s smaller than their aspirations,” Antonieta said. Olivia Papi, 17, got her senior prom dress at Madeleine’s Daughter in Portsmouth, N.H., then got her alterations done by Antonieta. Papi, who attends South Portland High School, was careful to choose where to splurge and where to save. Her biggest expense was her dress, which she said cost in the range of $250 to $500. To offset that cost, she will wear shoes that she already owns and decorate a church bus that’s on loan to her and her friends, instead of renting a limousine. Her grandmother won a gift certificate to Ferricchia Hair Salon in Portland, and she’ll use it to get her hair done for the senior prom on May 31. While some teenage girls splurge on prom night, boys tend to go for the prom package specials, which offer classic tuxedos for $79.99 at stores like Antoine’s Formal Wear in Portland. Accessories like special vests or fancier shoes cost more. Maalouf said his profit margin is higher if he can rent a tuxedo he has in stock. Special-order tuxedos may be priced higher, but he doesn’t earn as much on them because he doesn’t own them, he said. The biggest trend for boys? Last-minute shopping. Maalouf said some teenagers come in the day before, or the day of, the prom. Although prom sticker prices may shock some, Jay Zagorsky, a research scientist at Ohio State University’s Center for Human Resources, found that prom expenses haven’t been rising as much as overall consumer goods. With data from the Bureau of Labor Statistics covering 1998 through 2013, Zagorsky created a “Prom Price Index” from 10 components of the Consumer Price Index, including women’s dresses, women’s shoes, men’s suits and men’s shoes. Combining those categories, Zagorsky found that the price of going to the prom went up by 17 percent over that time span, less than half the 43 percent jump in the Consumer Price Index, according to his blog. Zagorsky found that clothing and shoe prices have fallen in price or increased only a small amount. In fact, the average man’s suit cost 13 percent less in 2013 than it did in 1998, he found. Prom-primping has gotten more extensive, running the gamut from facials and laser treatments for acne in the weeks before the prom to highlights, nails, make-up application and hair styling on the big day. Then there are the flowers. The cost of a prom is hefty enough that parents usually share the expenses, the Visa survey found. Parents cover 56 percent of prom costs, while their teenagers pay the rest. A year ago, parents said they would pay 59 percent of the costs, according to Visa. Different parts of the country have different budgets. On the West Coast, the average cost of a prom rose from last year and is expected to hit $1,125 per teenager, Visa found. The Northeast’s cost totaled $1,104, down 27 percent from last year. Midwestern and Southern families are expected to spend less, at $835 and $926, respectively. Visa has a smartphone app, called Plan’it Prom, that helps parents and teenagers plan and budget every aspect of the prom. “I think people are realizing that prom is a dance and you don’t have to spend like a celebrity to have a great time,” said Nat Sillin, Visa’s head of U.S. financial education.